I’m trying to be a little bit smarter about my snacking. I’m someone who has no problem snacking on nuts…so long as they have chocolate chips and dried cherries mixed in. But eating plain old nuts is no fun. So many people don’t like to eat nuts because they are so high in calories but they are also so high in good fat. Like with everything else, it’s about watching how much you eat and be careful with portions. But with nuts, they easily fill you up so a small handful (a portion) is just enough to do what a snack needs to do: satisfy! 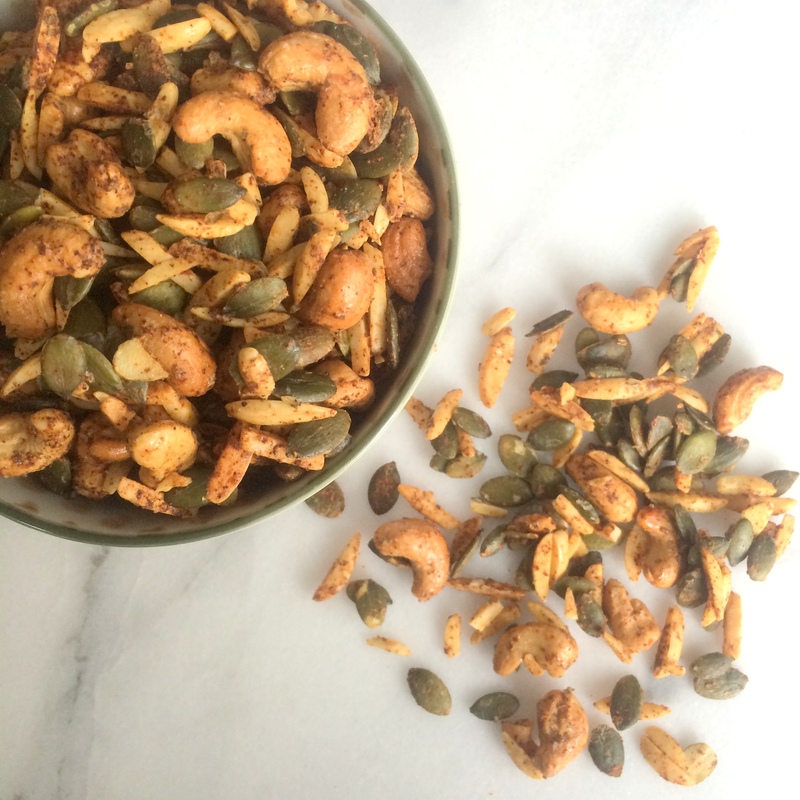 This Sweet Chipotle Snack Mix is a perfect snack mix to have on hand when my stomach is rumbling and I need something quick. 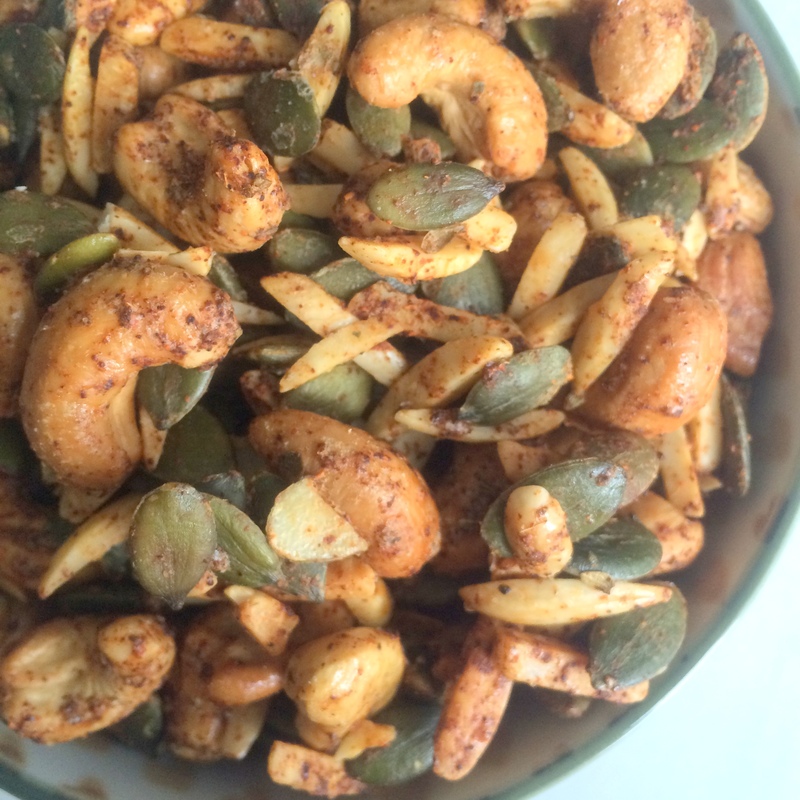 Slivered almonds, pumpkinseeds, and cashews are mixed with a frothy egg white and a spicy mixture of sugar (or Splenda), chipotle chile powder, cumin, oregano, and chile powder and baked until warm and crispy. Spices are a fun way to add a lot of calorie-free flavor to nuts to make them a little more interesting. Mixed with sugar, this spice mixture is sweet, spicy and smoky without being overly sweet, overly spicy or overly smoky. 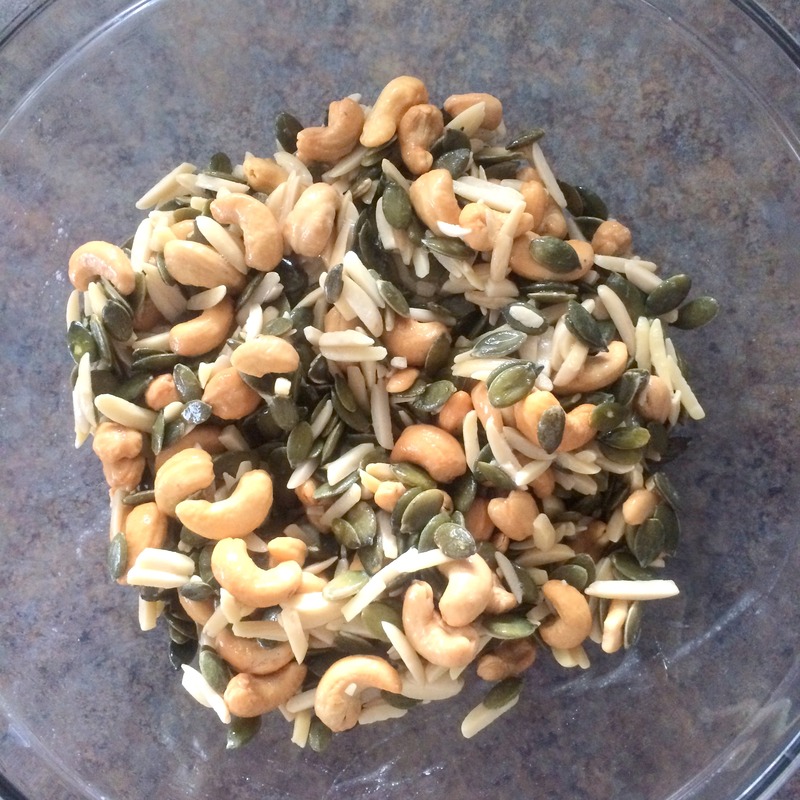 The combination is perfectly mellow but completely flavorful that makes this snack mix a little bit addicting. But just remember, a little goes a long way so this snack will last you for days and days. Preheat oven to 325°F. Combine sugar, salt, chipotle chile powder, cumin, oregano, and chili powder in a small bowl; stir with a whisk. Place egg white in a large bowl; stir with a whisk until foamy. 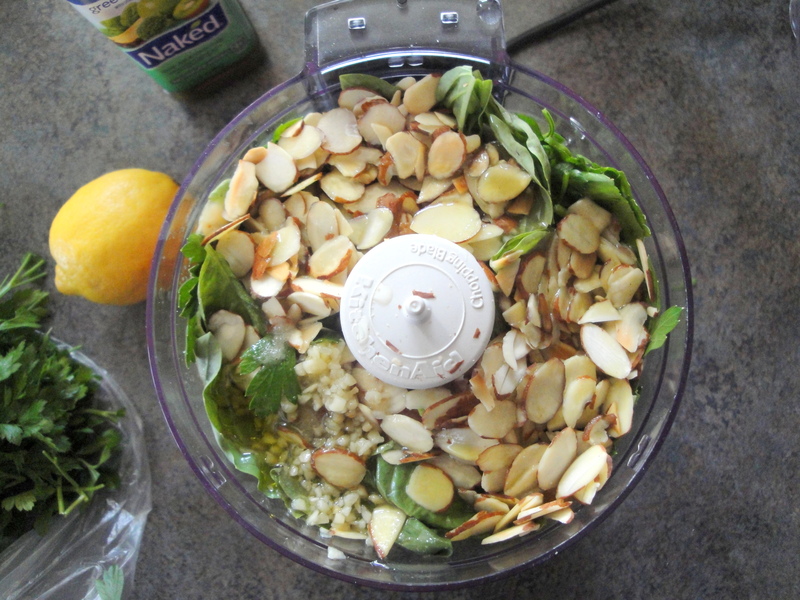 Add the almonds, cashews, and pumpkinseeds; toss well to coat. 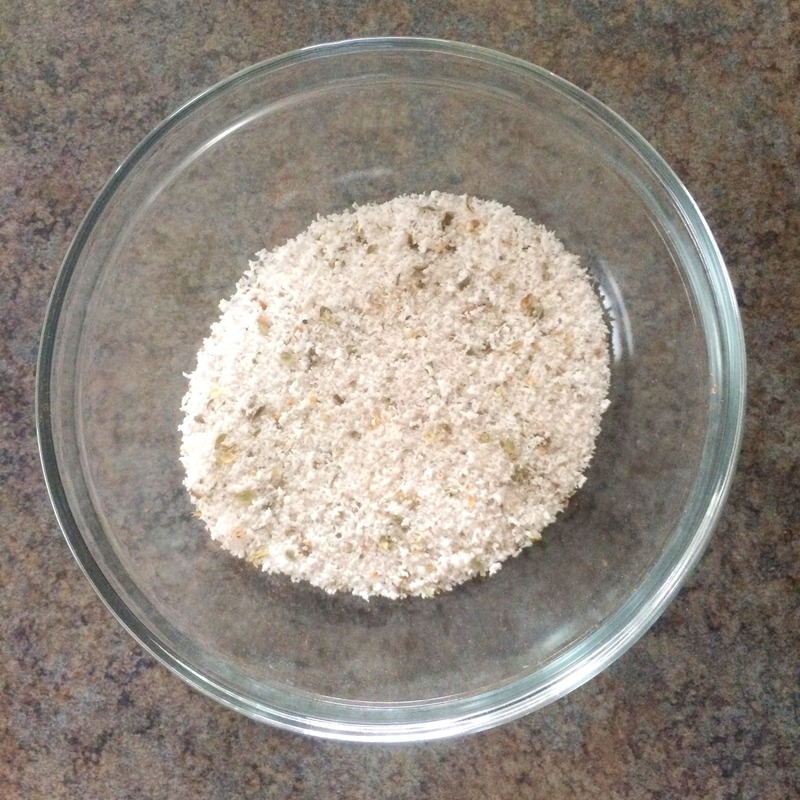 Sprinkle with spice mixture; toss well to coat. 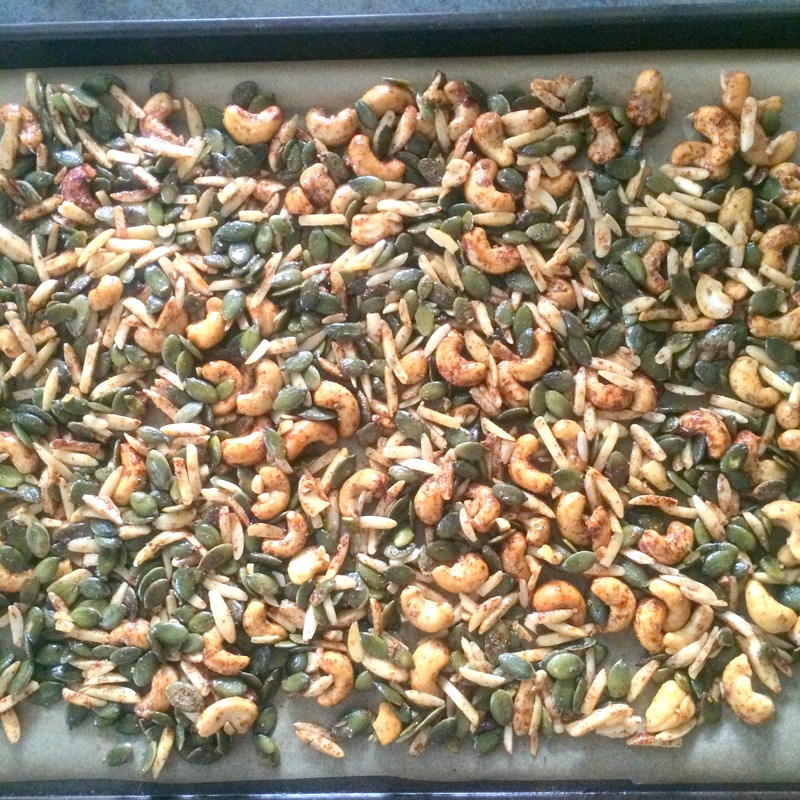 Spread nuts in an even layer on a baking sheet lined with parchment paper. Bake at 325°F for 15 minutes, stirring once. Turn oven off. Remove pan from oven; stir snack mix. Immediately return pan to oven for an additional 15 minutes (leave oven off). Remove pan from oven and place on a wire rack; cool completely. 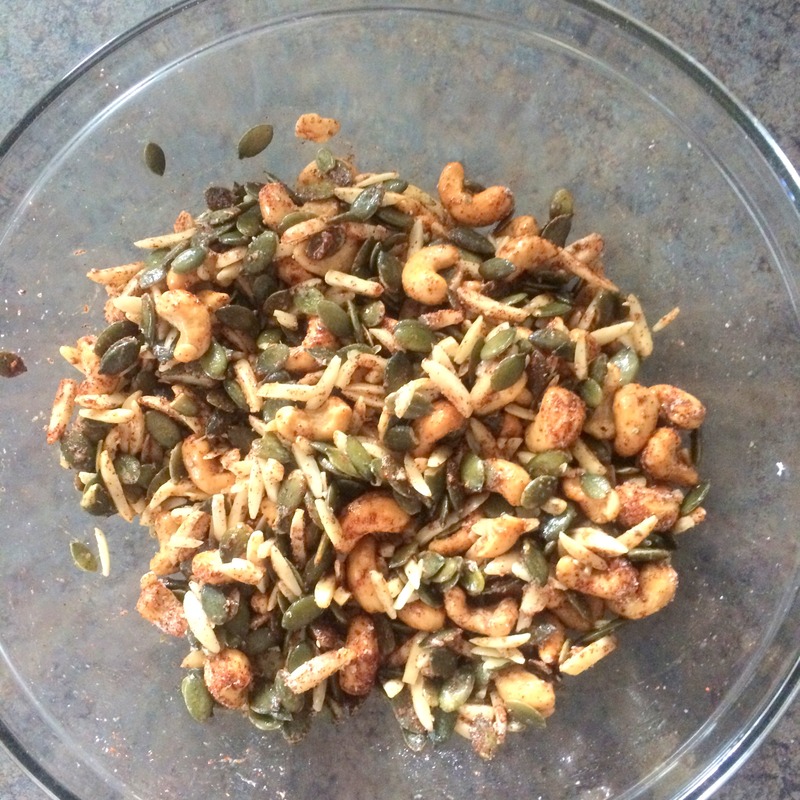 Store snack mix in an airtight container for up to 2 weeks. What is it about winter that makes baking so appealing? By the time the holidays roll around, I’m dying to start cookie baking. And even though that is all done with now and our lives are back to normal, baking is still appealing. Is it because of the weather? When it’s warm out, we don’t want to stay in the house, let alone to do something that requires turning on the oven. But in the winter, it just feels so right. Is it nesting? 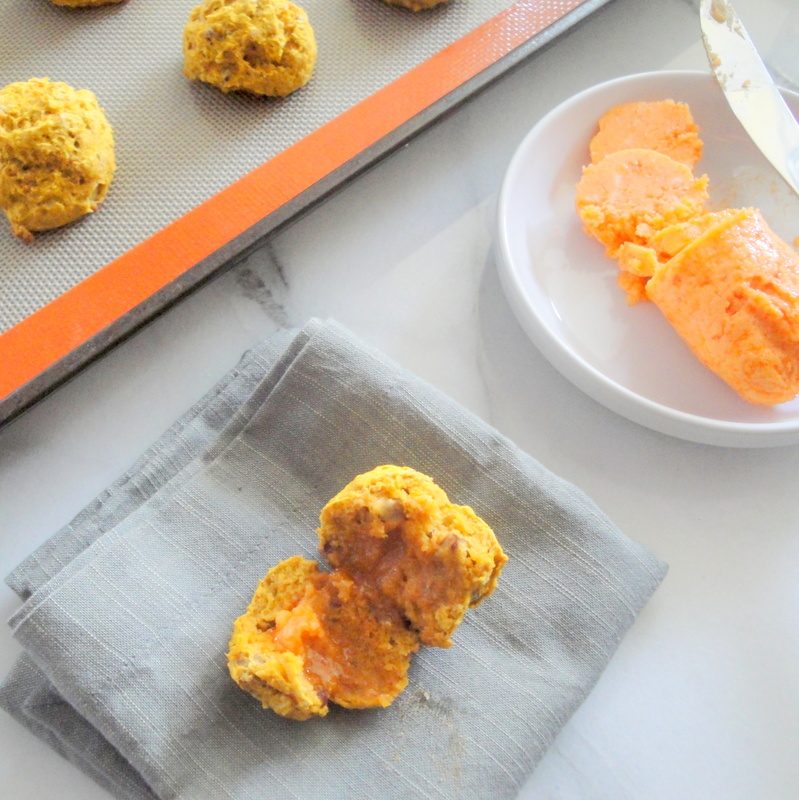 These Pecan-Pumpkin Drops didn’t require me hitting the grocery store for ingredients and neither did the Sriracha-Honey Butter I smeared on them! 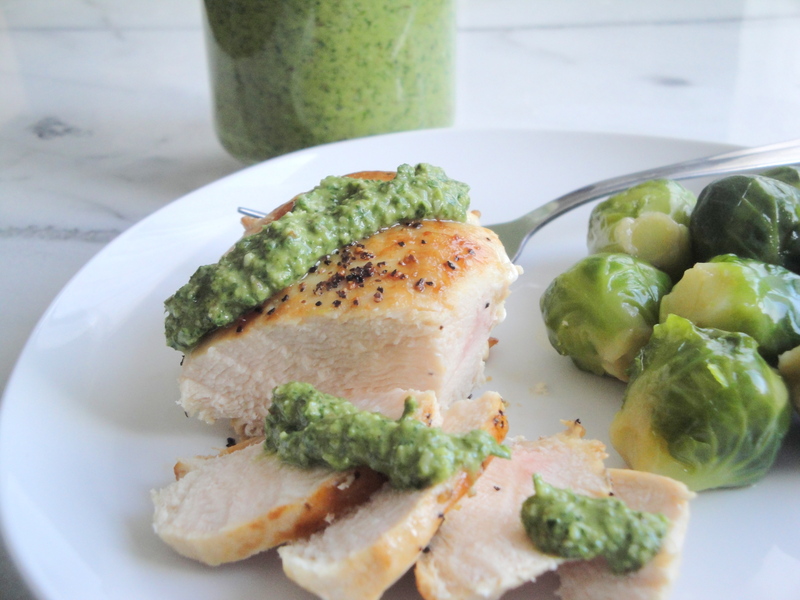 This combination of recipes was easy and didn’t require me going out in the cold for anything! Pumpkin and pecans, along with a little nutmeg, make up the primary flavors in these petite little muffins which are a perfect on their own or as an accompaniment to your winter meal. Served warm with a little butter or cream cheese would be oh-so-lovely but the sriracha-honey butter I smeared mine with gave these muffins another jolt. The sweet and spicy butter blended with the mellow pumpkin makes for a flavorful melt-in-your-mouth combo. Eat these muffins, and the butter, however you like. Just make them. Both. And stay warm! Preheat oven to 425°F. Weigh or lightly spoon flours into dry measuring cups; level with a knife. 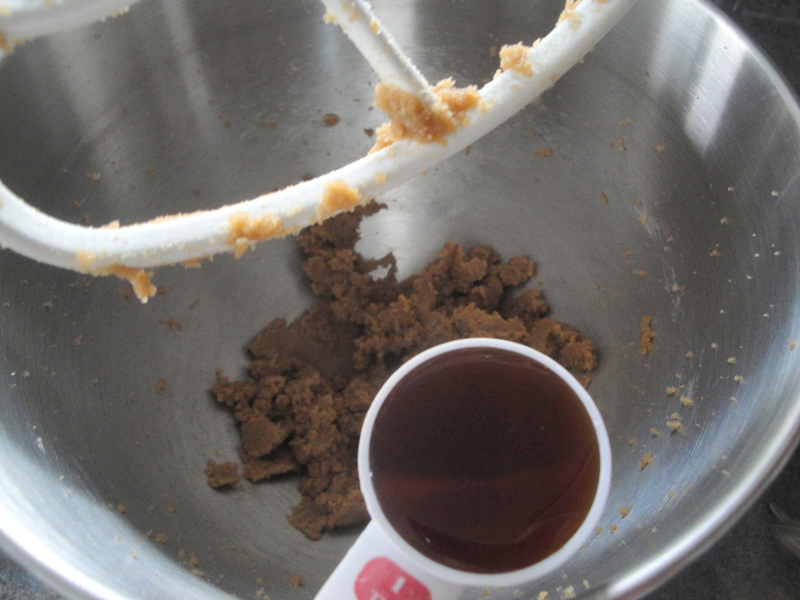 Combine flours, sugar, baking powder, baking soda, salt, and nutmeg in a bowl, stirring with a whisk; cut in butter with a pastry blender or 2 knives until mixture resembles coarse meal. 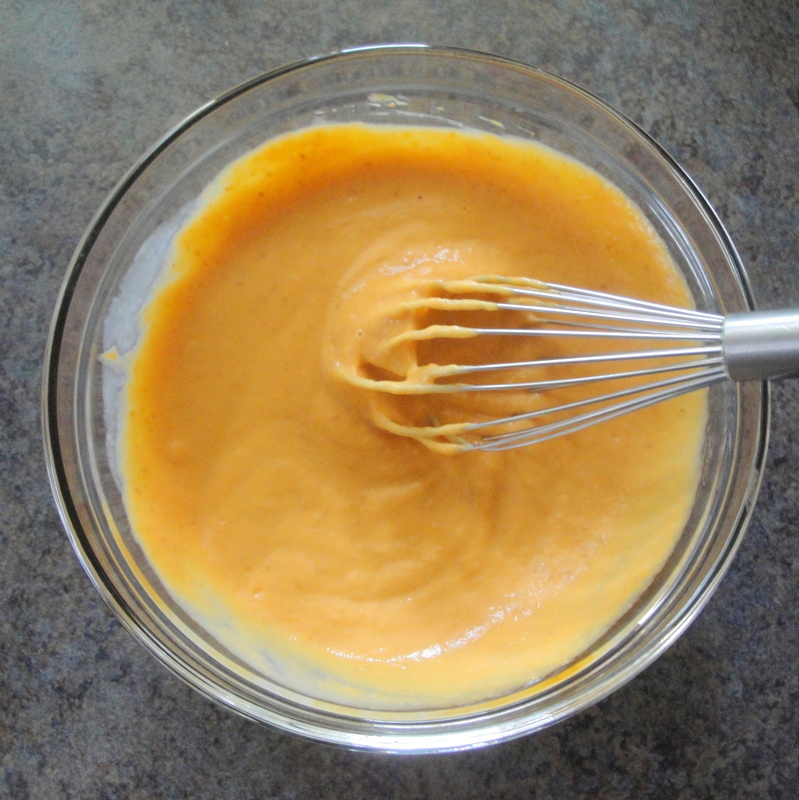 Combine pumpkin and buttermilk in a bowl, stirring with a whisk. 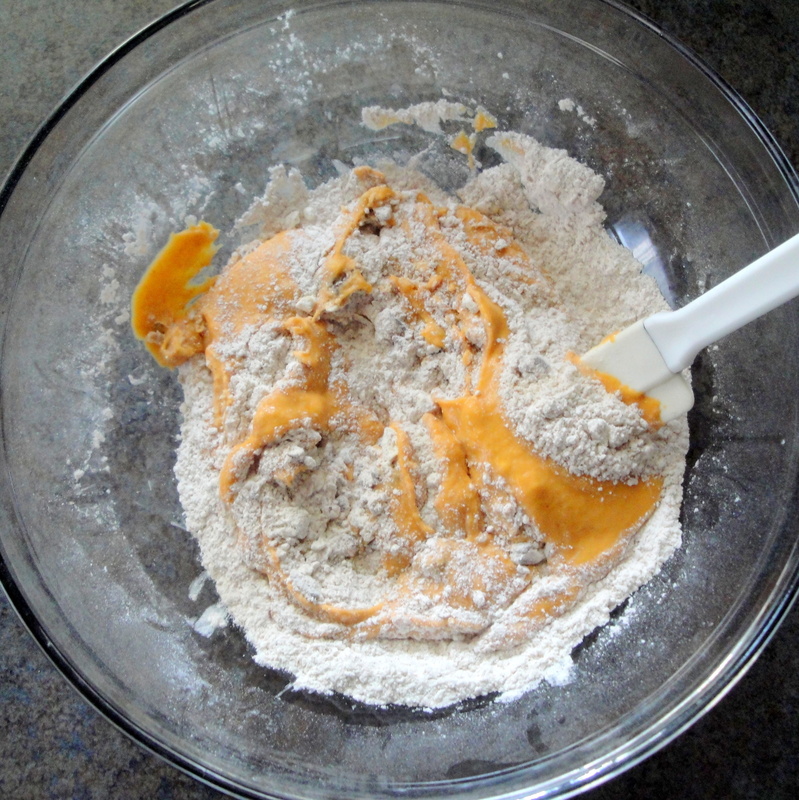 Add pumpkin mixture and chopped pecans to flour mixture, stirring just until combined. 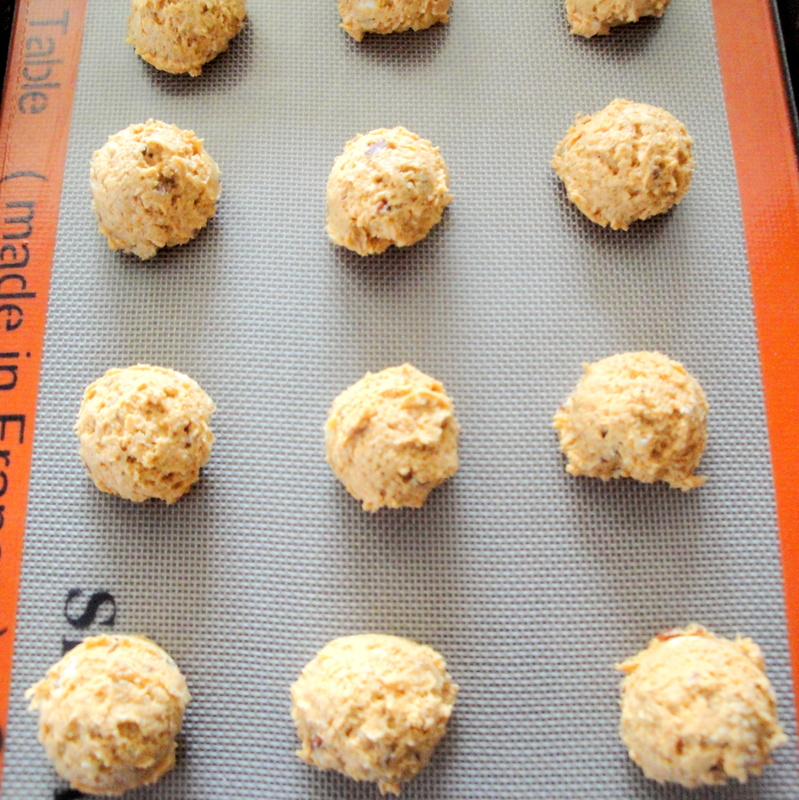 Drop batter in mounds of about 1/3-cupfuls onto a baking sheet coated with cooking spray. Bake at 425° for 14 minutes or until golden. Remove from baking sheet; cool 5 minutes on a wire rack. Serve warm. 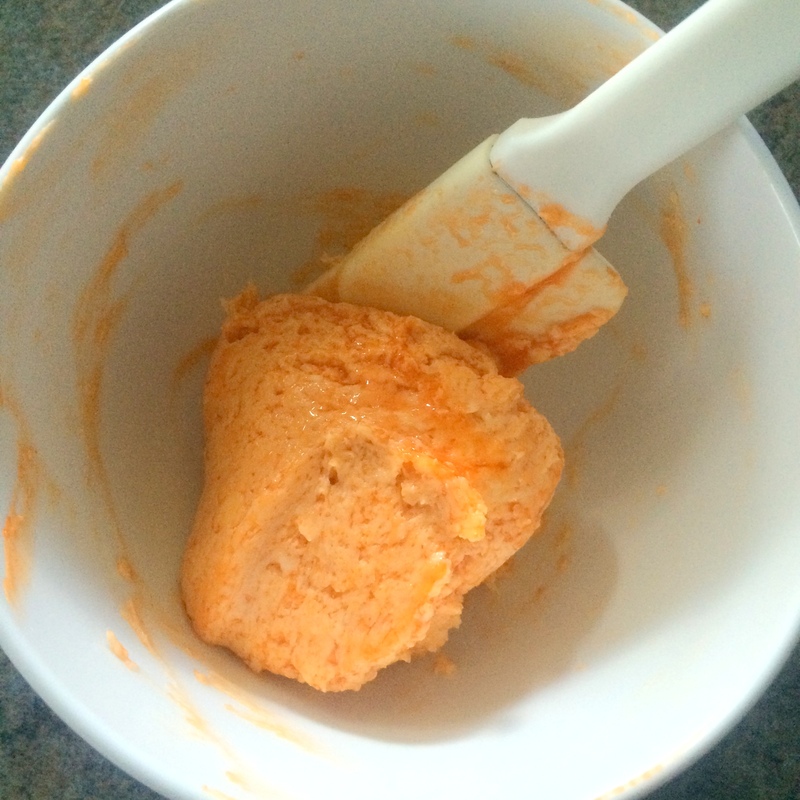 For the Sriracha-Honey Butter, combine butter, Sriracha, and honey in a bowl. I was away for work all of last week and even though I had made food to post ahead of time, I just never got around to it. I flew in on Friday and woke up on Saturday to having zero food in the house so I bundled myself up (seriously, why is it so cold??) and went to the grocery store, list in hand. After eating catered food for lunch and restaurant food for dinner every day, I was ready to eat some home-cooked meals and fresh produce. I’ve been eyeballing this recipe for Nut-Crusted Chicken for a while and decided it was time to get it done. 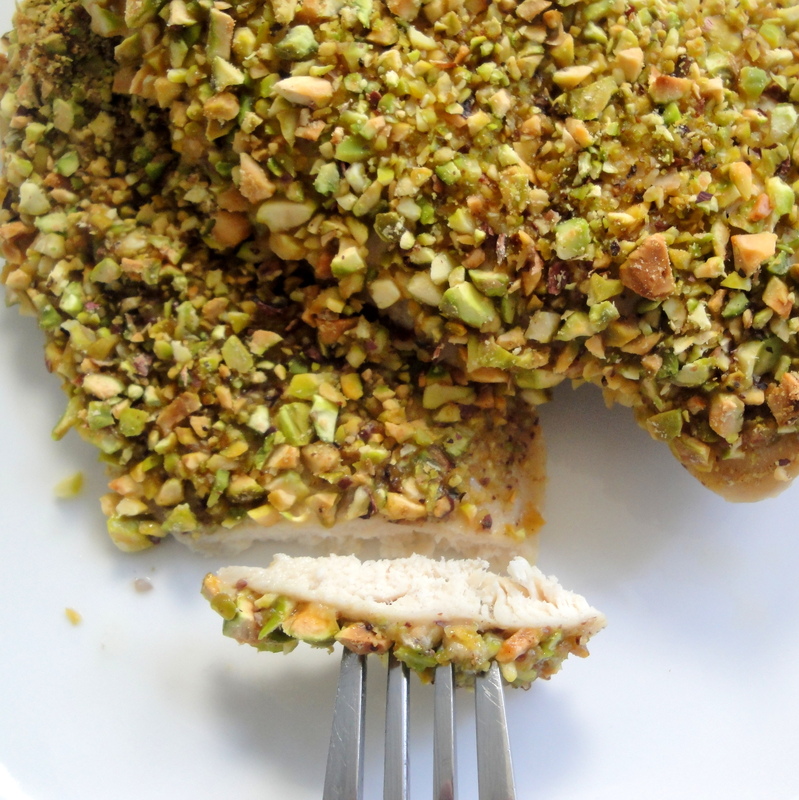 Dijon mustard, fresh orange juice, salt and pepper coat one side of boneless chicken breasts before being coated in chopped pistachio nuts and baked until perfect. 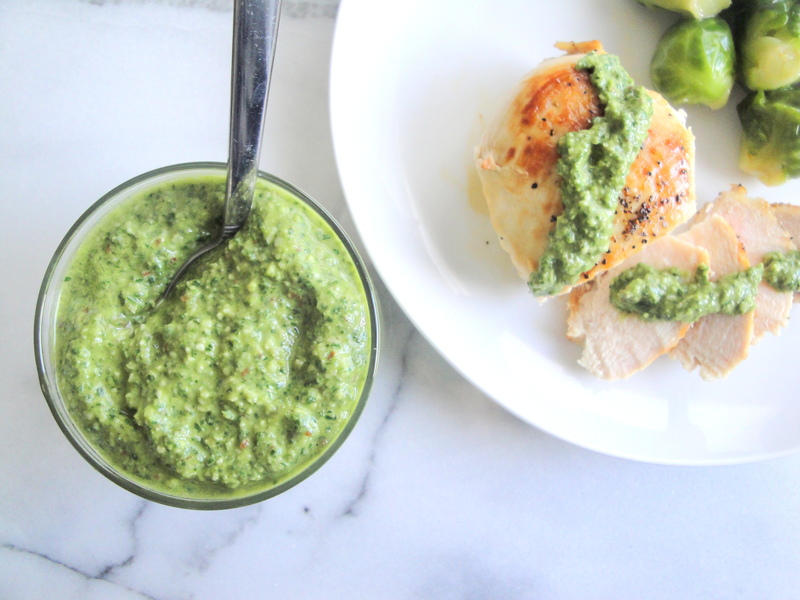 The tang of the mustard and saltiness of the pistachios pack this chicken with flavor leaving it anything but boring. I served mine with some orange-flavored broccoli which I’ll post tomorrow but by all means, try out the rest of the recipe by making the carrots included. Preheat oven to 425°F. Line a baking sheet with parchment paper. 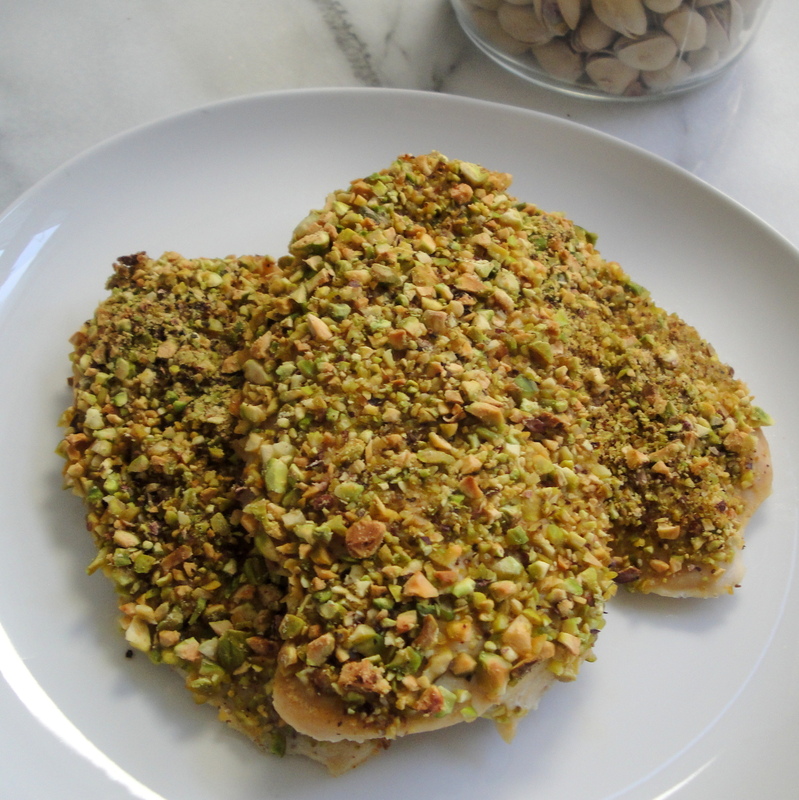 Place pistachios in a shallow bowl. 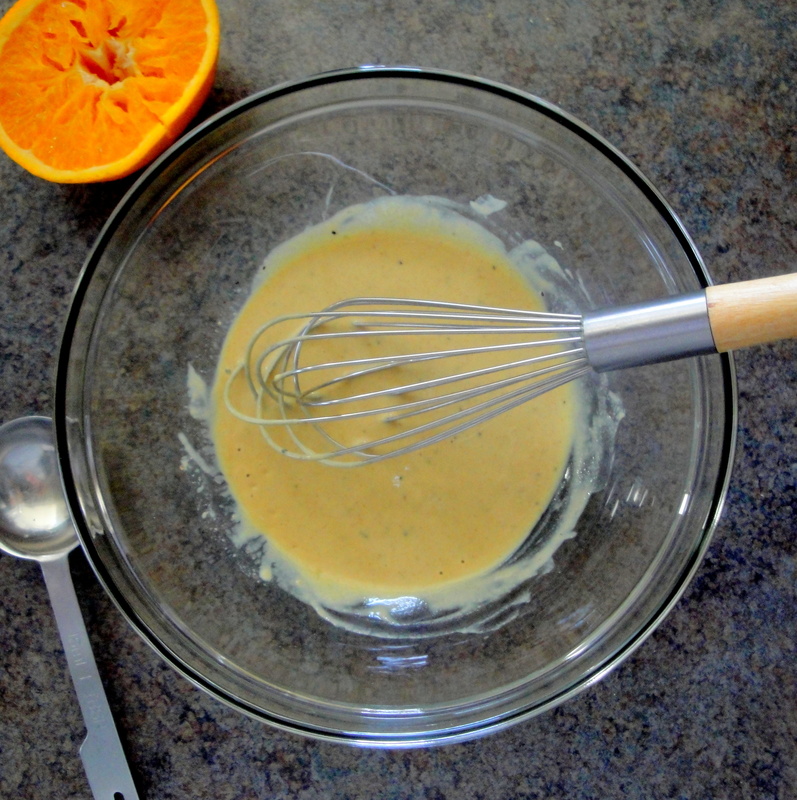 Whisk together mustard, orange juice, salt, and 1/4 teaspoon pepper in a second shallow bowl. 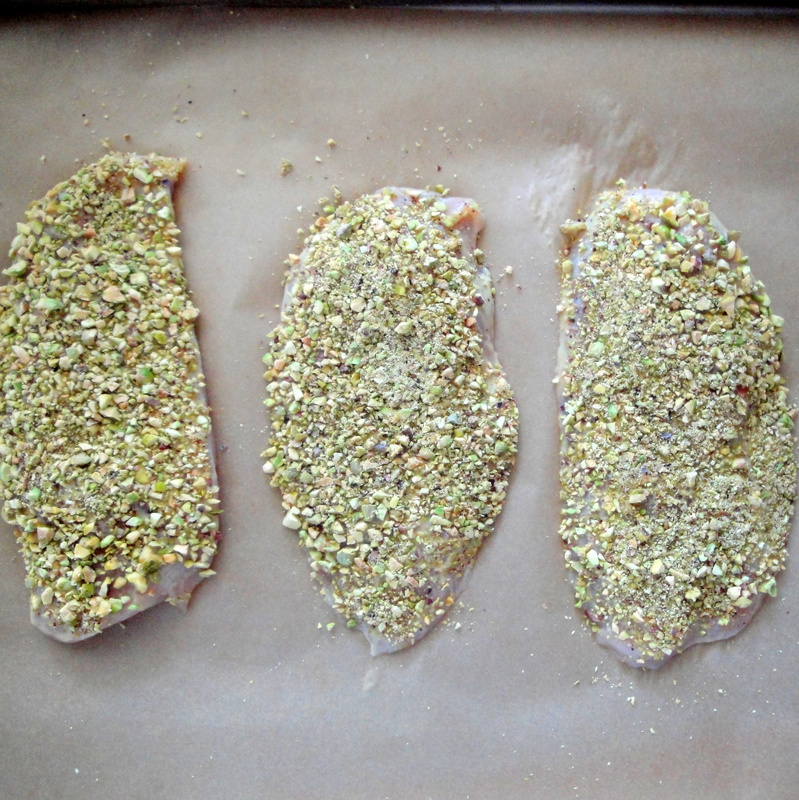 Coat 1 side of each chicken breast with mustard mixture, and dip coated side of chicken in chopped nuts. Place chicken, nut sides up, on prepared baking sheet. Sprinkle with remaining 1/4 teaspoon pepper. Bake 20 minutes or until chicken is cooked through and nuts are lightly browned. 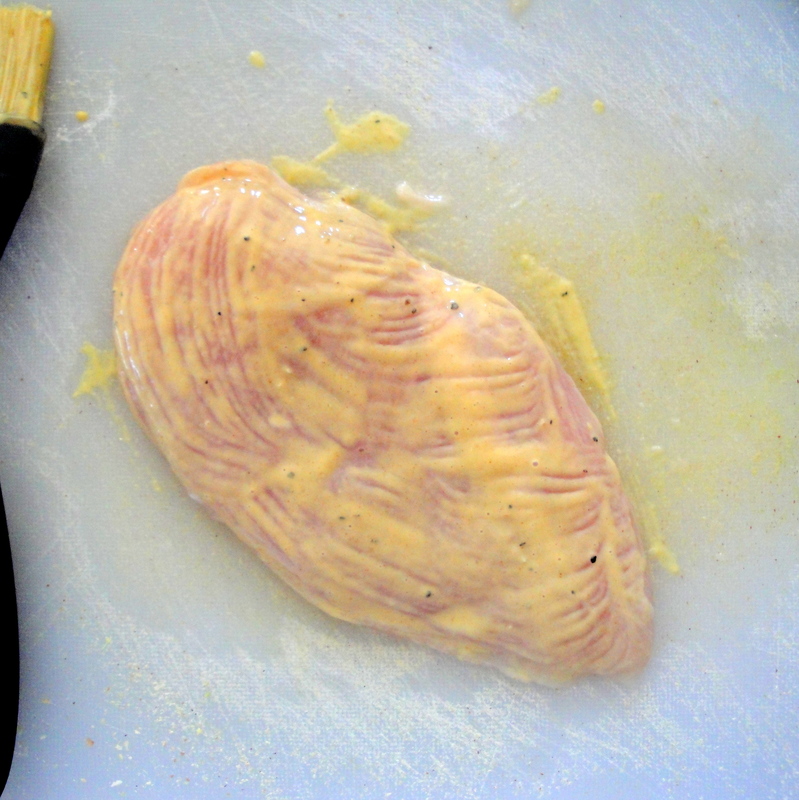 Sprinkle chicken with orange zest, if desired. How does December get so busy? Here it is already the 16th and I haven’t had one post since before Thanksgiving. Where does the time go? Well, Christmas is already next week (can you believe it?) 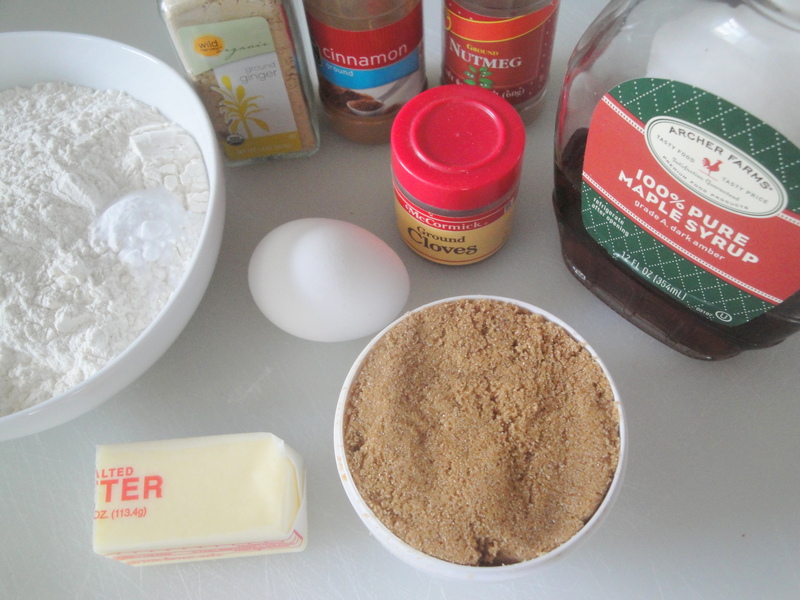 so in my world that means one thing – Christmas cookies! This week, that’s all I’ll have for you. Because I’ve decided that what I love making most of all is cookies. It’s time I sit down and figure out how in the world I could have my own cookie shop because it would make me so happy. 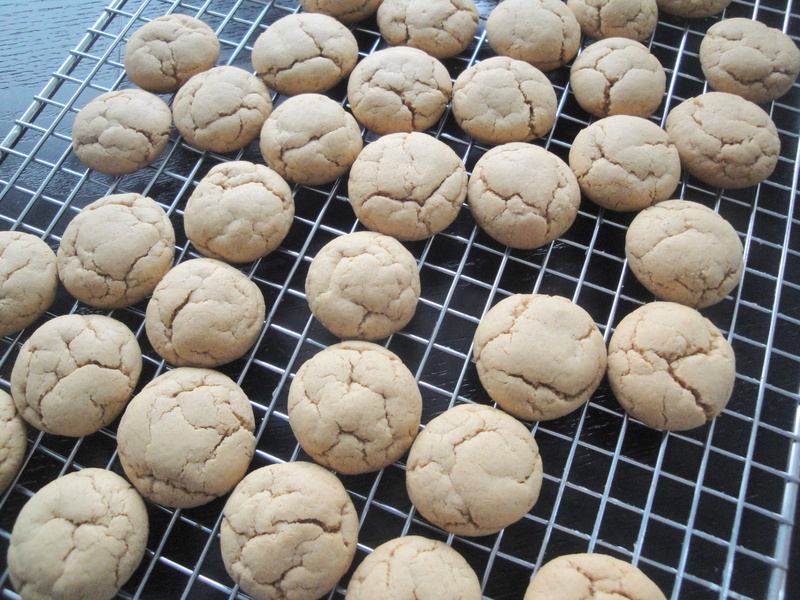 Anyway, the first cookie I have for you this week is Maple-Walnut Spice Cookies. Cinnamon, ground ginger, nutmeg and cloves are added to a maple-laced dough making for a spicy little holiday cookie (well, holiday in my book!). 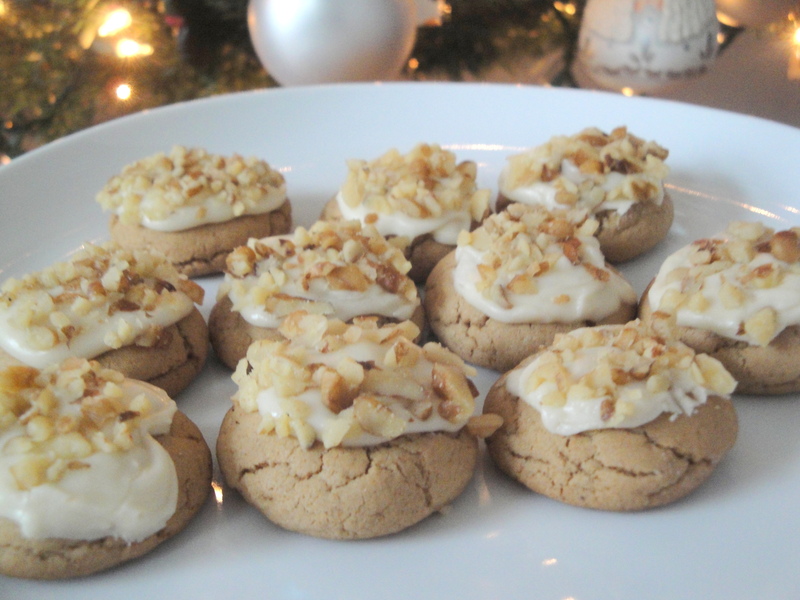 Topped with a simple frosting, also laced with maple syrup, and chopped walnuts, this cookie’s bold, unique flavor may not suit everyone’s palette but for someone looking for a cookie other than simple butter or chocolate chip, this might be for you. 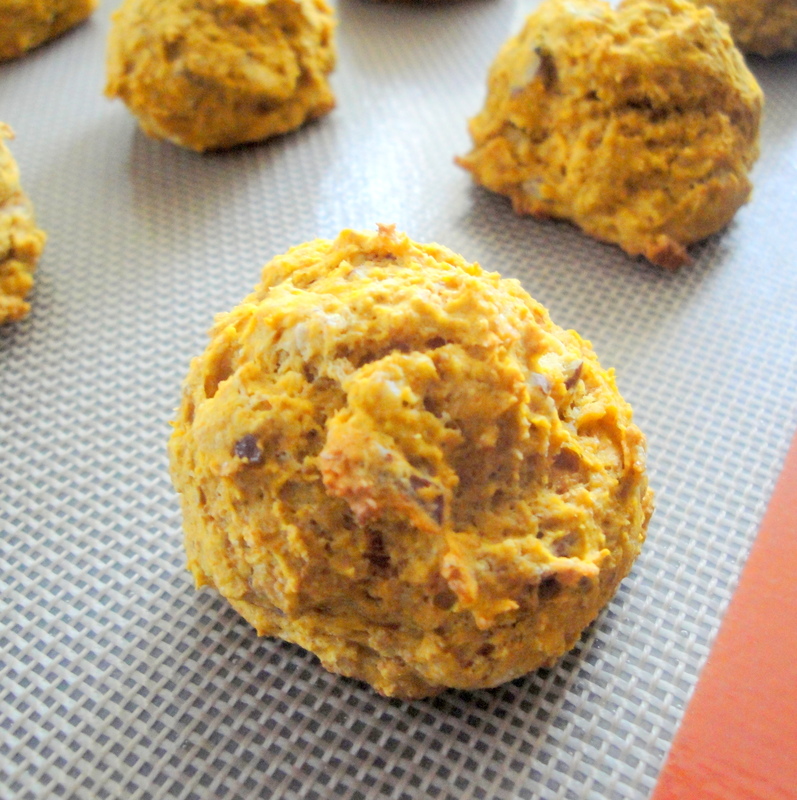 The dough is thick making it easy to roll into small balls of dough for easy baking. I made mine pretty small, trying to make them close to bite size since you probably wouldn’t want to eat too many of these spicy snacks in one sitting. 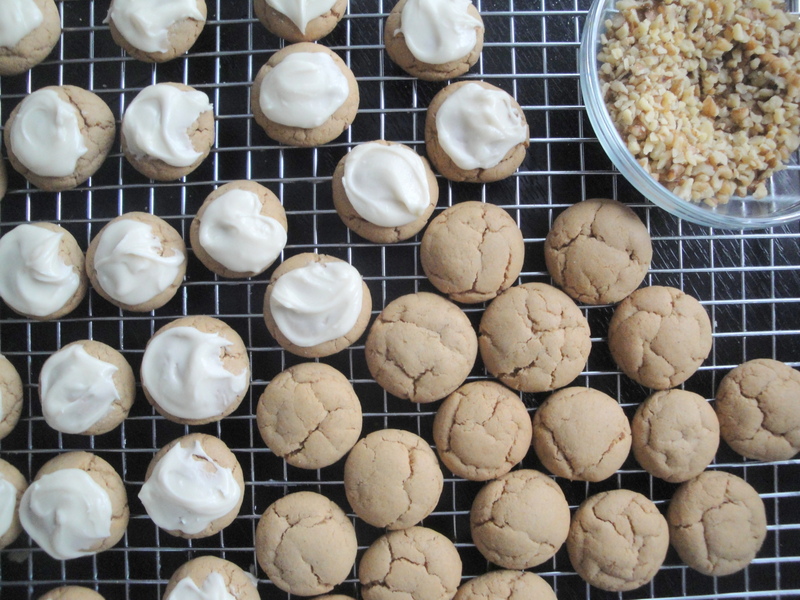 If you are looking for a grown-up substitute for gingerbread cookies, try these instead! Preheat oven to 350°F. 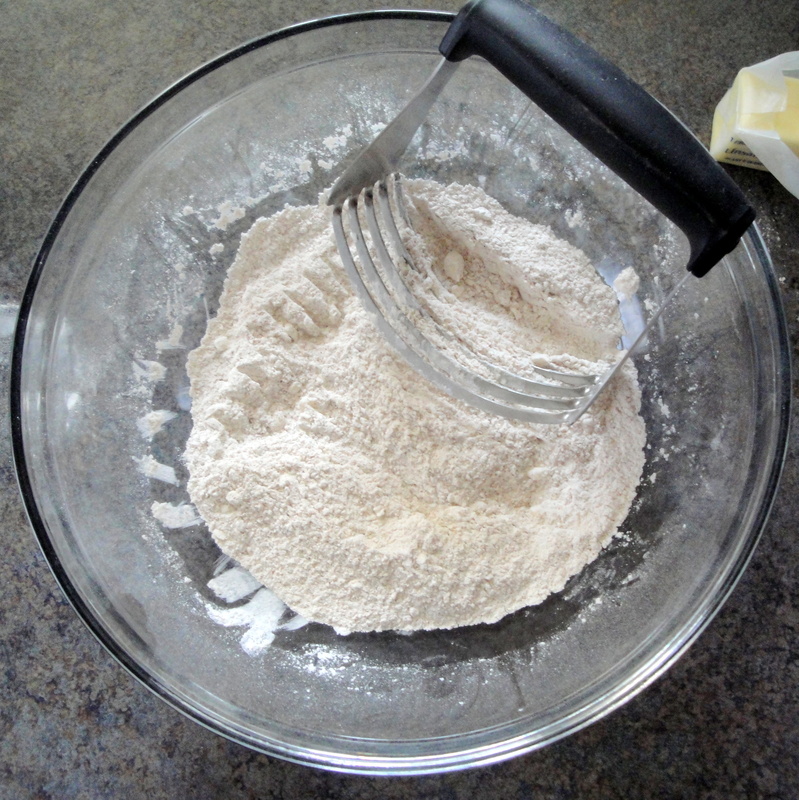 To prepare cookies, lightly spoon flour into dry measuring cups; level with a knife. 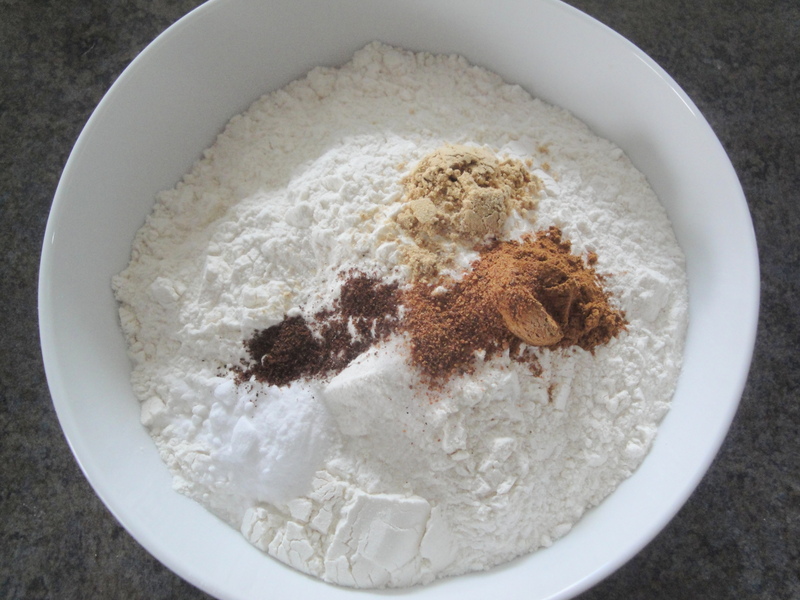 Combine flour and next 6 ingredients (through cloves) in a medium bowl, stirring well with a whisk. 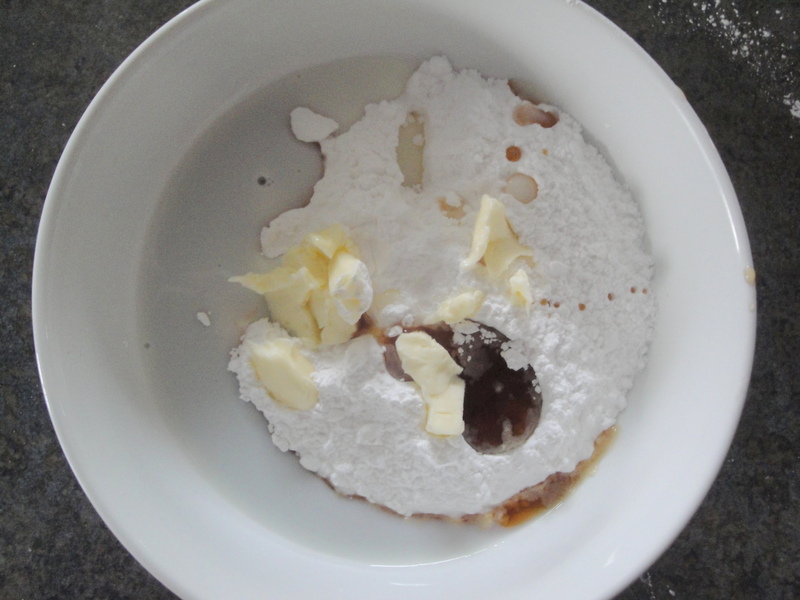 Place brown sugar and 1/4 cup butter in a large bowl; beat with a mixer at high speed until light and fluffy (about 4 minutes). 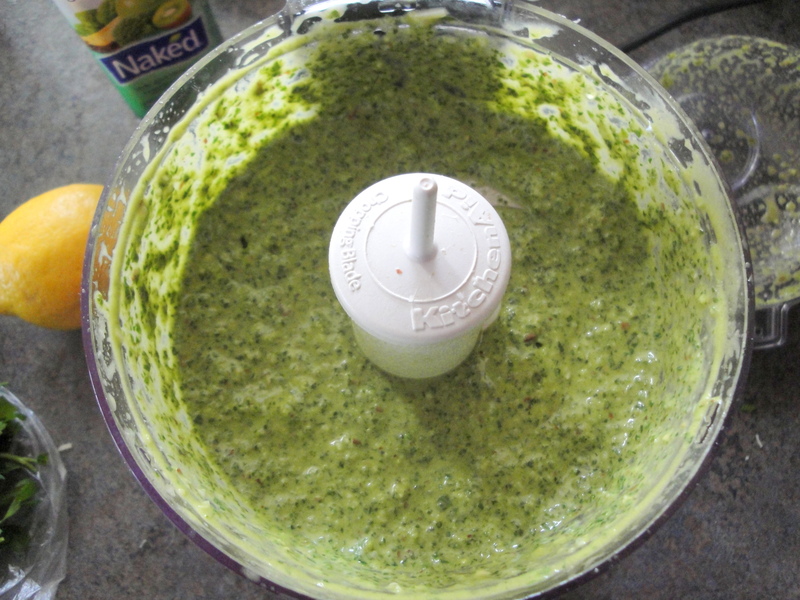 Add 2 tablespoons syrup and egg; beat until well blended. 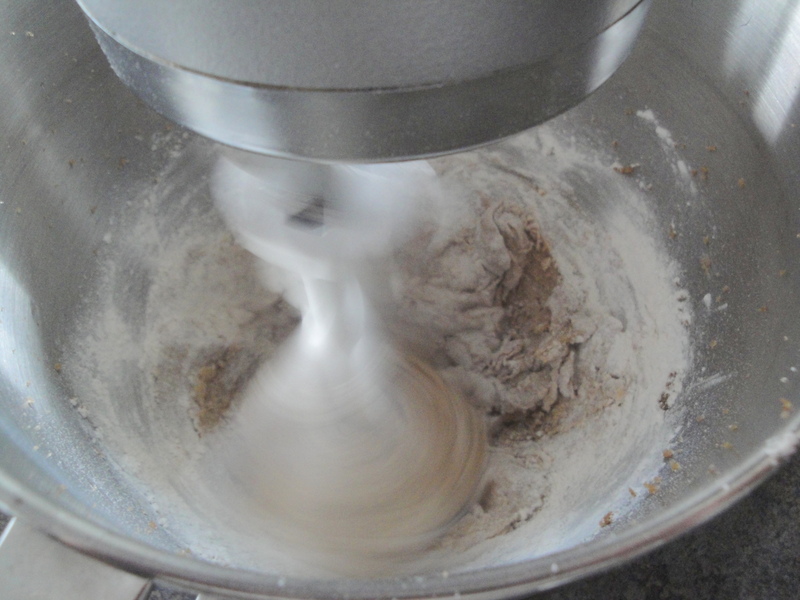 Beating at low speed, gradually add flour mixture; beat just until combined. Spoon batter evenly into 30 mounds (about 1 tablespoon) 2 inches apart on baking sheets. Bake at 350°F for 14 minutes or until lightly browned. Cool on pans 5 minutes. Remove from pans; cool completely on wire racks. To prepare frosting, combine powdered sugar, 2 tablespoons syrup, milk, and 2 teaspoons butter, stirring with a whisk until smooth. Spread frosting evenly over cooled cookies. Working quickly, sprinkle cookies with nuts. 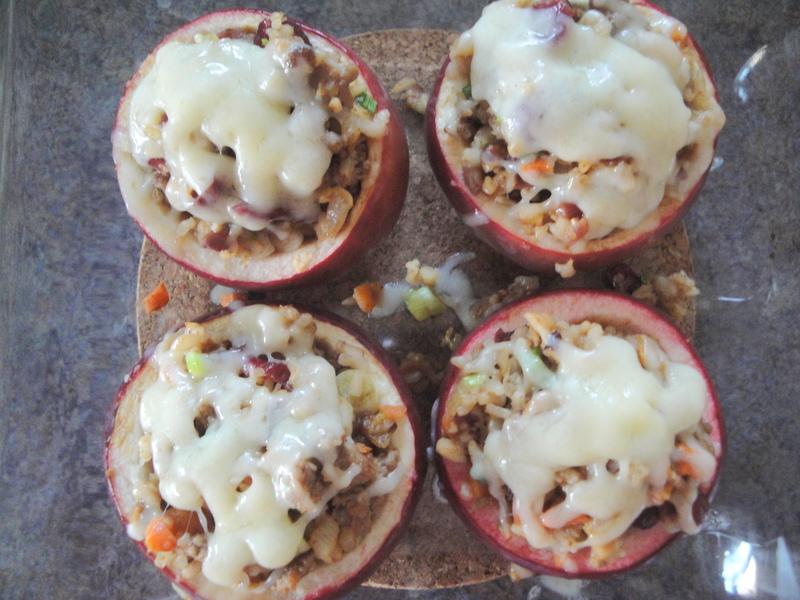 I remember when I first saw the recipe for these Savory Baked Apples, my jaw dropped and my mouth watered so there may or may not have been some drooling involved. And since every time I come across it I remind myself how much I want to make them, I’m shocked that it’s taken me so long to actually get around to doing it. Let’s be honest, the thought of scooping out apple pulp to make hollowed out apples sounds awful but it really wasn’t that bad. I’d scooped out tomatoes for a similar dish once and it was much, much worse than this (my kitchen counter looked like I’d slaughtered something). The key is patience, which I don’t have. But the reality is, even if you mess it up and it looks awful, it’ll still taste the same so who cares? This is one quintessential autumn dish that is worth it. 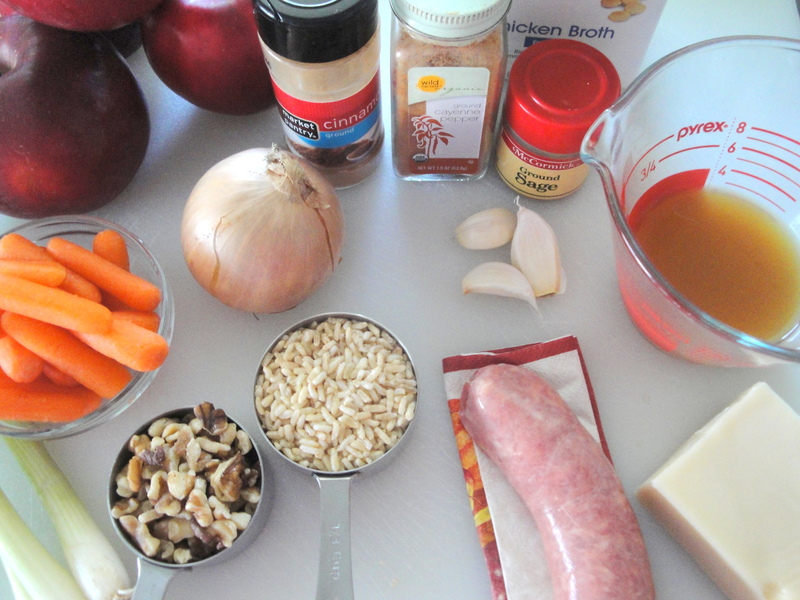 Apples are baked in the oven until soft and filled with a cooked mixture of sweet sausage, brown rice, carrots, onion, walnuts, apple cider, dried cranberries, and scallions. Shredded Swiss cheese is added to the top and broiled adding the perfect cheesy bite as a finale. Cinnamon, sage and cayenne pepper, combined with the sweet smell of the baked apples, give this dish an overall aroma of Fall that makes your whole house smell like a big warm hug. The end result is a comforting dish that’s both savory and a little bit sweet. Want something a little bit different for Thanksgiving? Look here. Preheat oven to 350°F. Bring broth to a boil in a saucepan. 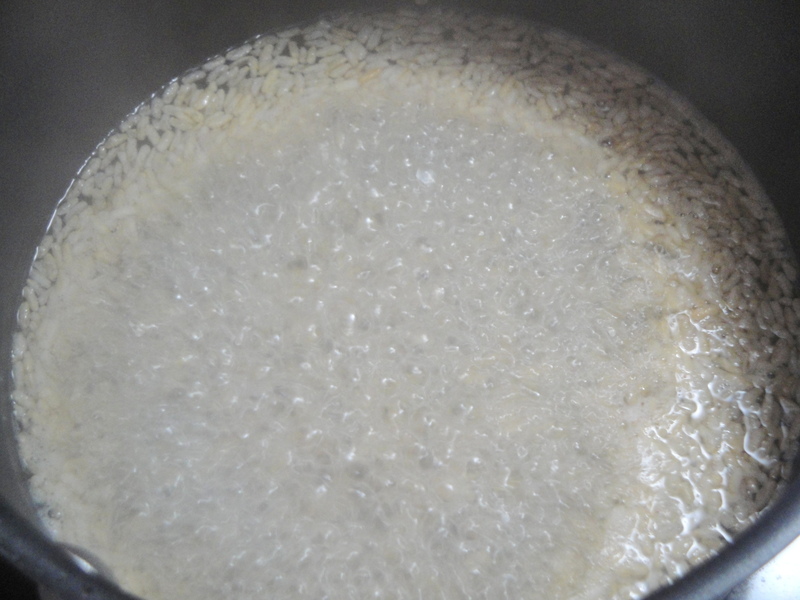 Stir in rice. Cover, reduce heat, and simmer 50 minutes. Remove from heat. Let stand 10 minutes. 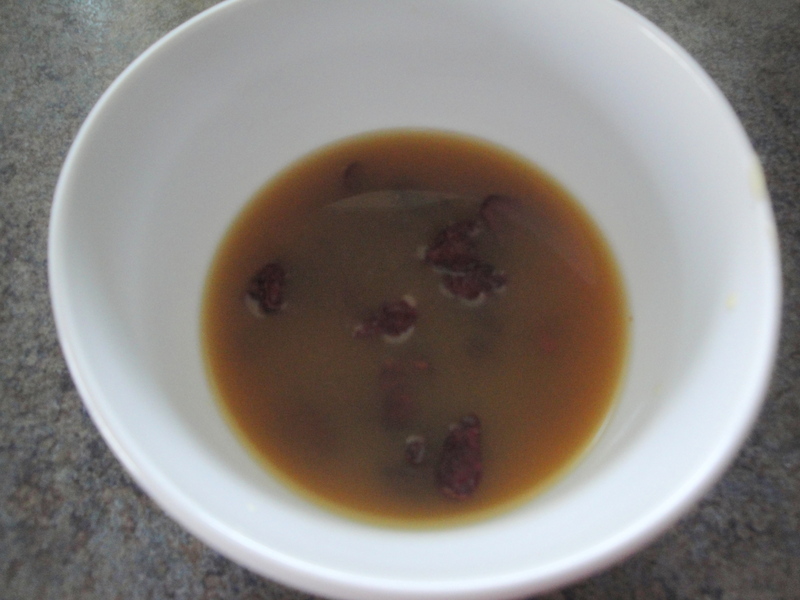 Combine cranberries and cider in a microwave-safe bowl; microwave at HIGH 1 minute. Let stand for 10 minutes. 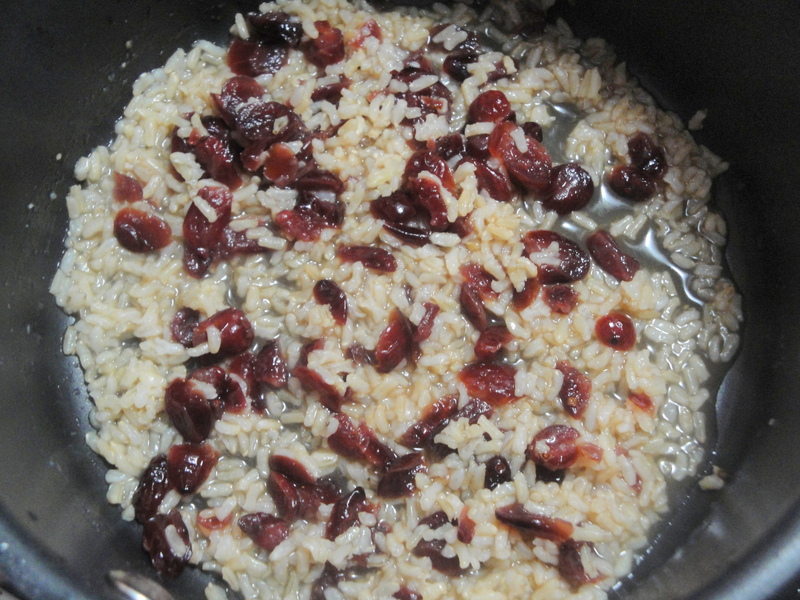 Add mixture to rice. 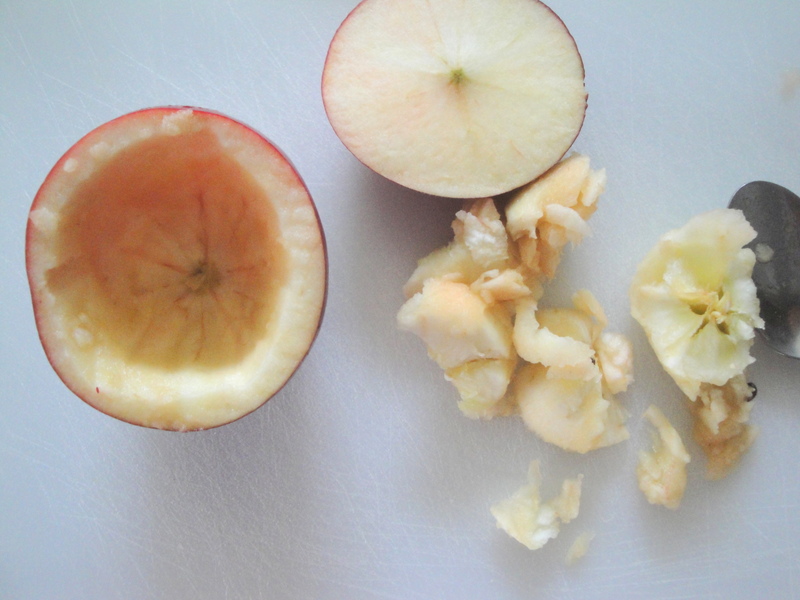 Using a small spoon, carefully scoop out centers of apples, leaving a 1/2-inch-thick shell, and chop apple flesh. 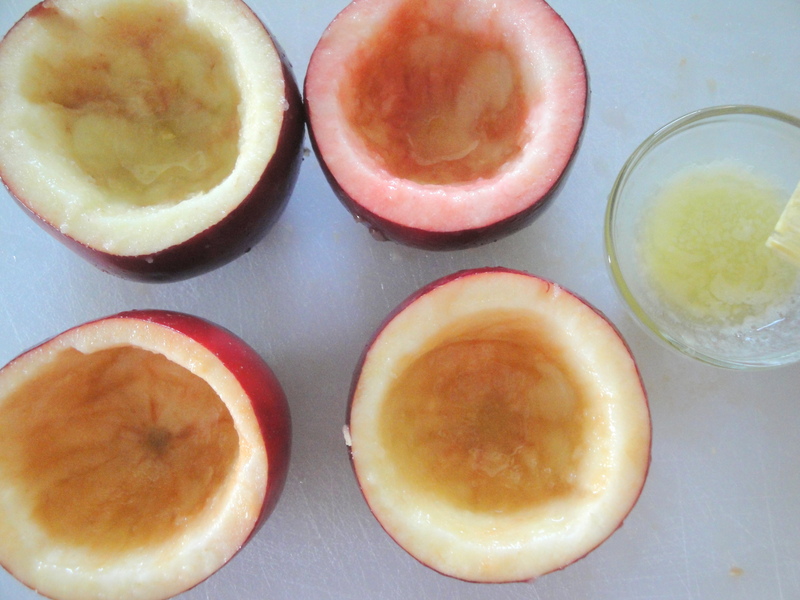 Brush the inside of apples with 1 tablespoon butter. Place apples on a baking sheet, and bake at 350° for 25 minutes or until just tender. Preheat broiler to high. Heat a large skillet over medium-high heat. 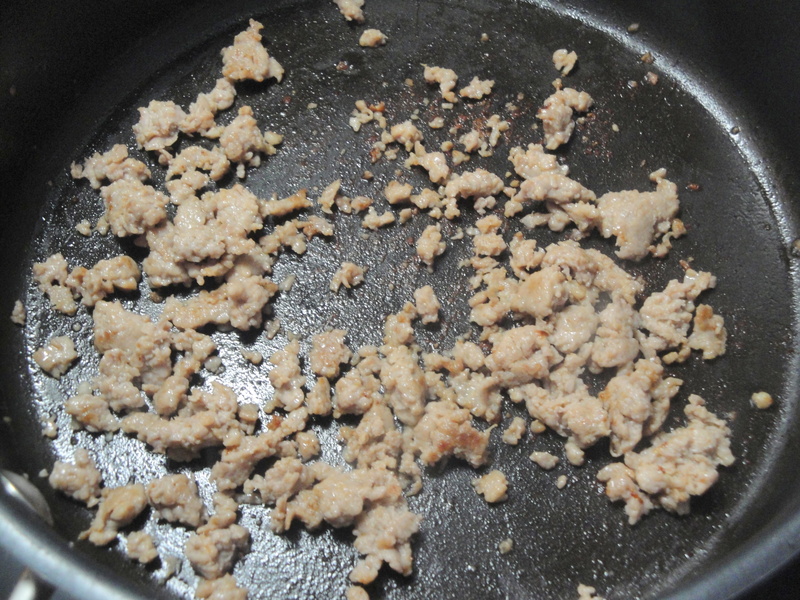 Add sausage, and sauté 5 minutes, stirring to crumble. Remove from pan; drain. Wipe skillet, and melt remaining butter in pan. 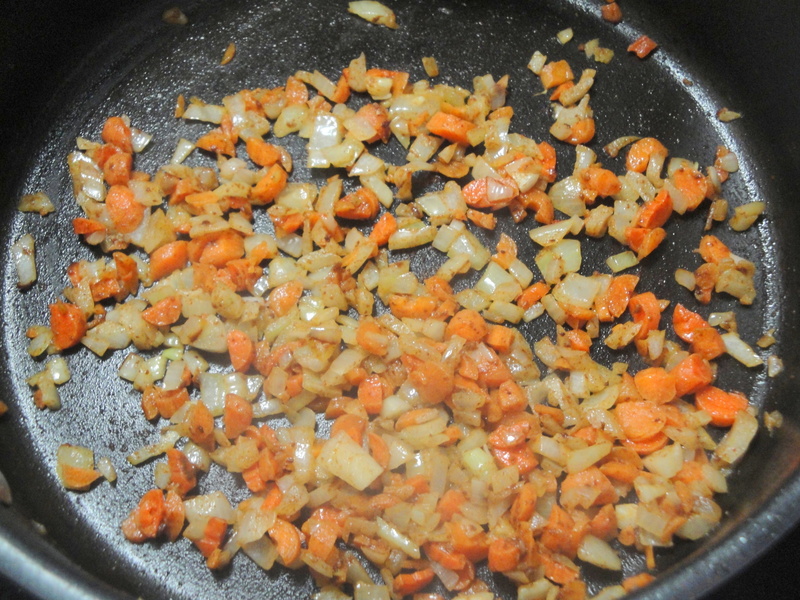 Add chopped apple, yellow onion, and next 3 ingredients (through pepper); sauté 4 minutes. Add garlic; sauté for 1 minute, stirring constantly. 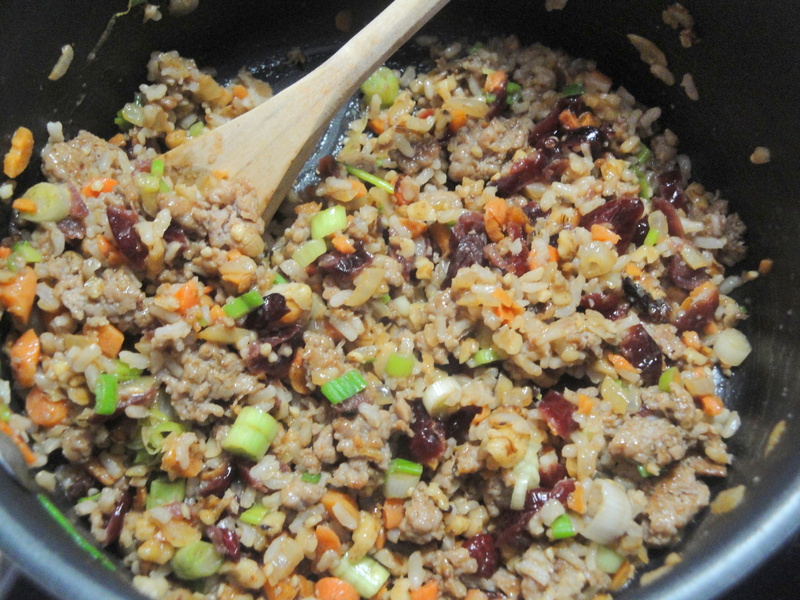 Add sausage, onion mixture, walnuts, and next 3 ingredients (through sage) to rice; toss. 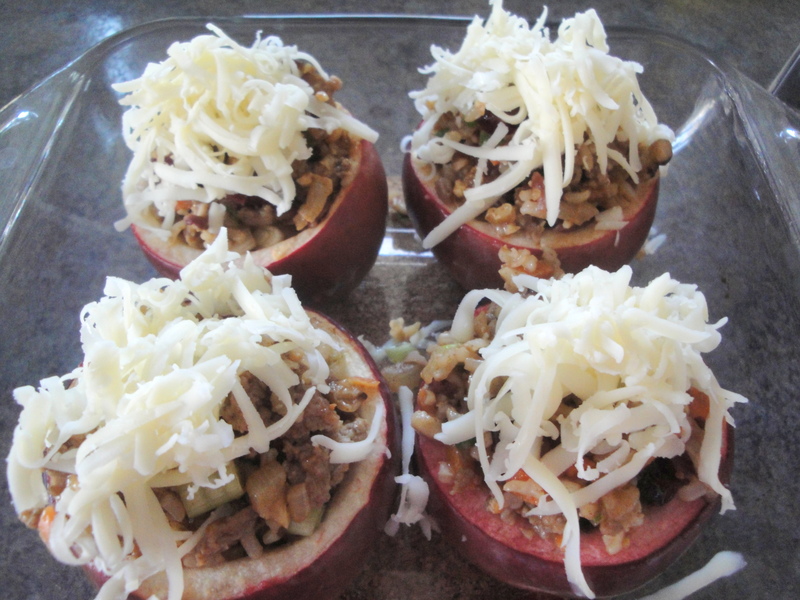 Divide rice mixture evenly among apples; top with cheese. Broil for 5 minutes or until golden. Have you been hearing about “superfoods” lately? Foods that are supposedly the most nutritious food we can put into our bodies? Well, I have. The list of the top superfoods can vary by professional or article but I’ve seen enough written on the topic to know that quinoa, sweet potatoes, and spinach are all top contenders. 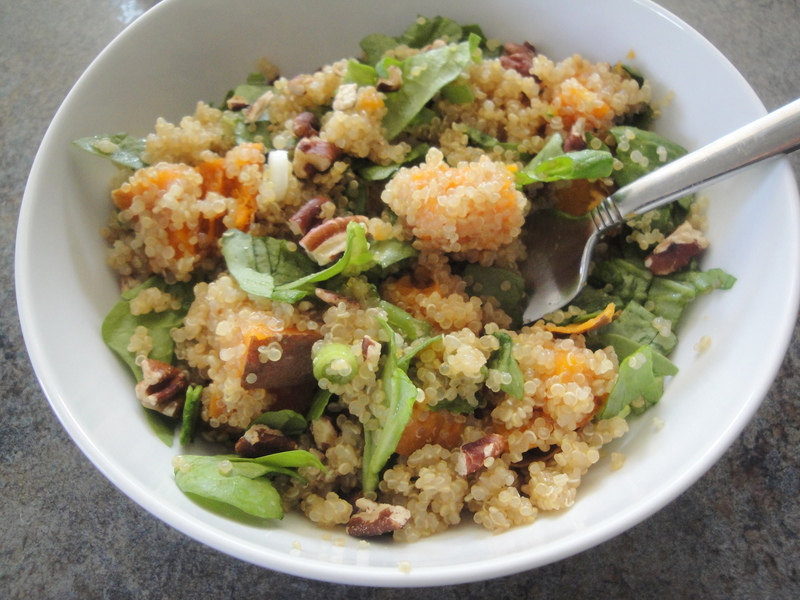 So when I came across a feature in Cooking Light magazine of different low-calorie quinoa combos, I was drawn to this Roots, Greens, and Shoots combination. 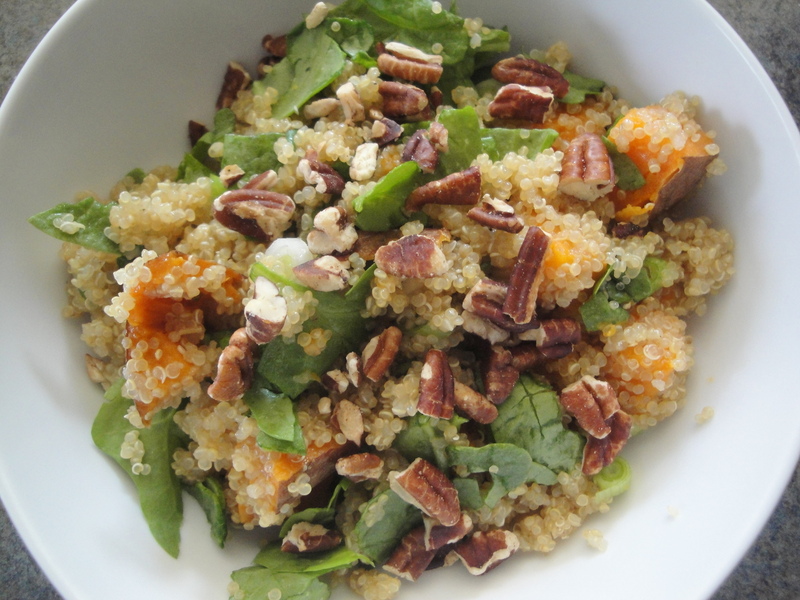 With nothing more than roasted sweet potato, baby spinach, toasted pecans and scallions, this quick meal is about as nutritious as you can get. 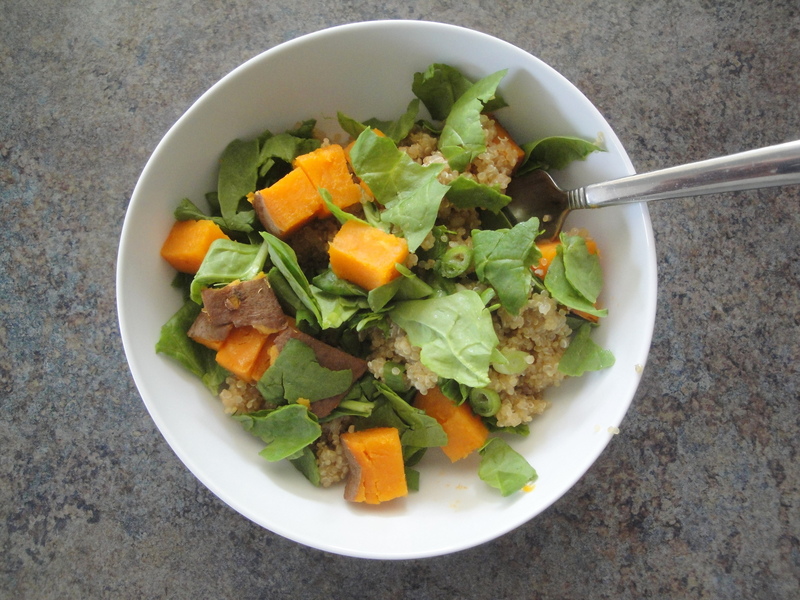 If you have a spare sweet potato or some leftover cooked quinoa, you also have a speedy meal. But if not, either roast a sweet potato in a 375 degree oven for 30-40 minutes or buy a super-simple pre-wrapped sweet potato and microwave according to the directions. 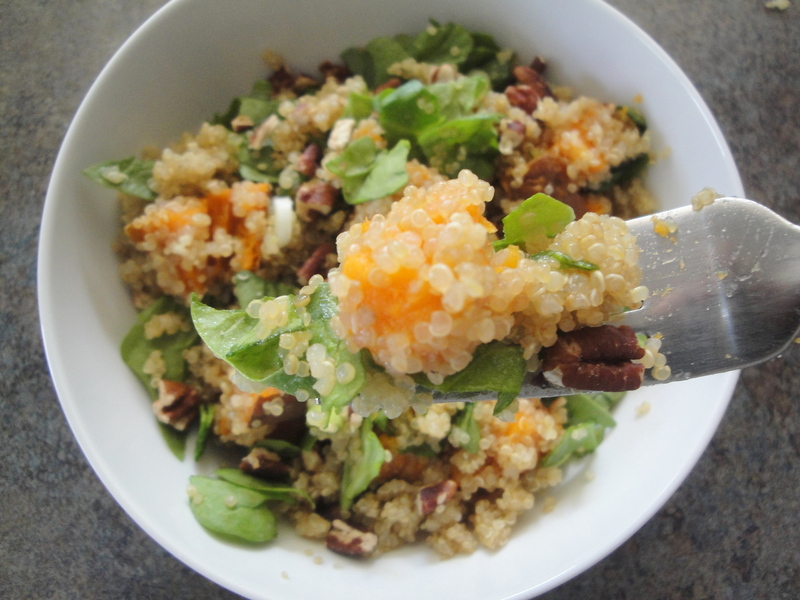 Quinoa, which has become an easy replacement for rice in my house, can be cooked in 15 minutes with a 2:1 water ratio. Although there isn’t any dressing or other flavoring to this dish, you might think this would be pretty bland but on the contrary, the combination of the sweetness in the potato, the crunch of the pecans and the zing of the scallions made this easily one of my favorite quick meals I’ve ever made. In fact, it’s super. 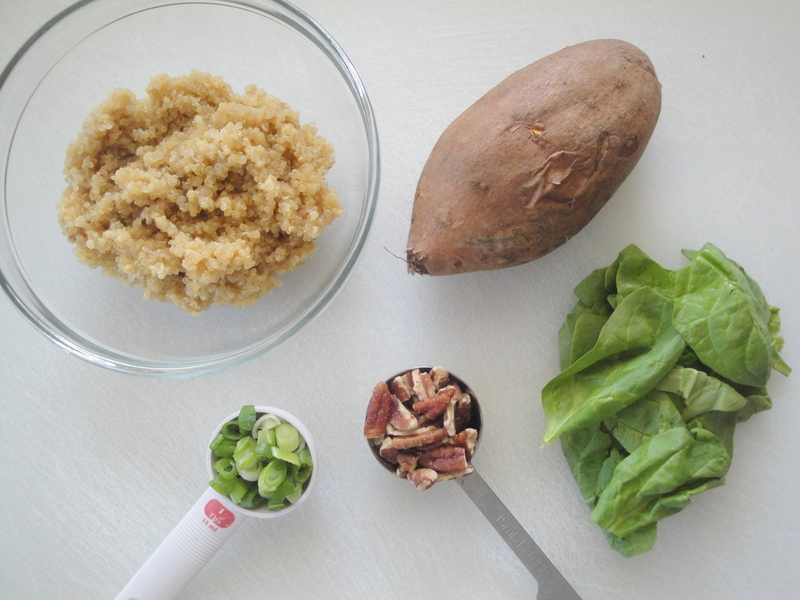 Combine chopped sweet potato, torn spinach, and sliced scallions in a bowl.